Scott Huler is right to take the North Carolina legislature to task for trying to legislate whether or not ocean levels are rising: NC Considers Making Sea Level Rise Illegal. Yet like President Obama before him, Huler reveals his own ignorance when he invokes another tired historical myth. Contrary to what Huler would like, there is no evidence that Galileo ever uttered the words “eppur si muove” (corrected the typo—changed “is” to “si”). The earliest record of Galileo purportedly saying “And yet it moves” (as “eppur si muove” is often translated) occurred in Giuseppe Baretti’s Italian Library , in 1757. And yet it lives, like the mythical flat earth. 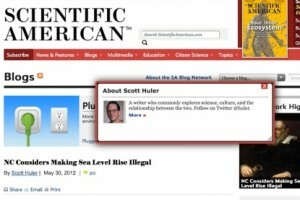 Scott Huler’s profile at Scientific American . We might want to be lenient on President Obama when he referred to the flat earth. After all, he doesn’t pretend to have any historical or scientific expertise. Huler, by contrast, claims to explore “science, culture, and the relationship between the two.” We can and should expect more from him. An internet search would have turned up the Italian wikipedia page and the English wikipedia page as well as a number of other pages that dispel this myth. Huler undermines his own credibility and does a disservice to Scientific American when he appeals to an easily refuted historical myth. Postscript: North Carolina is not the first state to legislate the natural world. Both New Mexico and Illinois have legislated Pluto back into a planet. 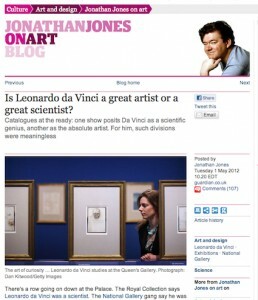 Jonathan Jones’s review of Leonardo exhibitions. Two current shows on Leonardo da Vinci have prompted the perennial speculation about his status as an artist or a scientist. Jonathan Jones wants Leonardo to be “a scientist and an artist at the same time.” Thony over at The Renaissance Mathematicus takes Jones to task for making a category error, pointing out that for Leonardo the categories artist and scientist didn’t exist. Thony then defended his position: to apply either artist or scientist as we normally use those terms to Leonardo is incorrect, anachronistic, and ahistorical. Thony explains how the “occupational categories” of artist and of scientist didn’t exist. He offers, instead, the artist-engineer (see his book review for how this term applies to Galileo). Thony’s posts raise important historiographic questions: What is science and how do we identify science in the past? The identity of science and the authority it enjoys in our modern world often inform how we categorize past activities. In a sophisticated version of Collingwood’s scissors-and-paste history: when something looks like science to us we assume it is and was science. Here the historian in the present decides what was science in the past and then goes off in search of it. The historian then compiles a story to support those decisions. 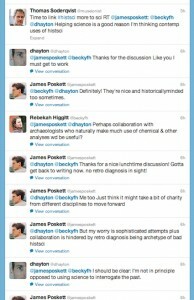 The historian determines both the appropriate questions or topics and the legitmate answers or accounts. Such an approach seems to work fine, giving us histories populated with names like Copernicus, Vesalius, Kepler, Harvey, Galileo, Descartes, Boyle, Newton, etc. But such an approach too readily equates science with a thing and reduces the people who might have been doing science to shorthand references in the timeline of science. Our developmental stories about science trace its progression from some benighted past to an increasingly enlighted present. Such an approach encourages us to ask: Who got it right and who got it wrong? Copernicus and his heliocentric astronomy superseded medieval astrology. Boyle’s chemistry replaced earlier alchemical practices. Bacon’s New Science with its use of experiment replaced an outmoded Aristotelianism with its reliance on book learning. And of course Newton. While the range of acceptable topics and questions has expanded (see Pamela Smith’s recent review “Science on the Move: Recent Trends in the History of Early Modern Science,” Renaissance Quarterly 62 (2009): 345–75), much historiography remains progressive, especially outside the rather narrow confines of history of science. Science isn’t and never was a thing lying around to be discovered. Science is and always has been a human activity. Althouh the products of science—laws of nature, facts, statements about the world out there—look like they have some existence beyond the humans who articulate them, in the end even they are the products of human activity and have meaning only insofar as other humans give them meaning. Our histories, thus, have to be about people engaged in this activity. We should ask questions about how and why they engaged in that activity, how and why they modified their pursuit of that activity, and how pursuing that activity informed and was informed by the other activities they pursued. Thinking of science as a human activity shifts our focus from the products of science to the humans doing science. We can’t simply evaluate statements about the world out there and laws about it. The value we place on what people in the past produced bears no necessary relation to what those people thought they were doing or how they valued their products. We need to ask instead about what people were doing and why were they doing it otherwise we risk misunderstanding the products of their activity. Skilled players are the best experts on the identity and rules of the game. This list illustrates, I hope, the ways that games and science are similar activities. This list also has important consequences for how we study the history of science (For a fuller treatment of science as a game, see A. Cunningham, “Getting the Game Rigth: Some Plain Words on the Identity and Invention of Science” Studies in History and Philosophy of Science , 19 (1988): 365–388). Most importantly, it cautions us against imposing our idea of science on the actions of people in the past, regardless of how familiar their actions may appear. Instead, we need to start from the description people in the past used or would have used to explain their activity. They are the experts in the game they were playing. We must begin with the actors’ categories in our effort to reconstruct what they were doing. Rather than assume that somebody was doing science when that person was investigating nature, we need to ask: What was that person doing when investigating nature? What was that intentional activity? What were the rules and conventions that structured it? What were its goals? Why did the person choose to engage in that particular activity? Newton’s Philosophiae naturalis principia mathematica is not science. If we take such questions seriously we will have a hard time finding anybody before the nineteenth century doing science as we understand that activity. As Thony pointed out in his posts, there is more at issue here than simply the coining of a term—there was no such thing as a scientist avant la lettre because there was no such thing as science. No matter how often Newton has been labeled a scientist, as Thony again usefully points out, Newton was principally concerned with God. And no matter how often Newton’s Philosophiae naturalis principia mathematica has been described as a scientific text,it was, as the fuller title of his book indicates, a work of natural philosophy, an enterprise that took as one of its main goals understanding God. Nature was the object of investigation but not the goal. 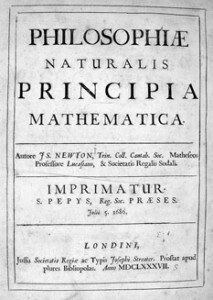 For a fuller discussion of Newton’s Principia , see A. Cunningham, “How the Principia Got Its Name: Or, Taking Natural Philosophy Seriously” History of Science 29 (1991): 377–392 (available online here). Science means something to us becasue it describes a particular game along with all the rules and conventions and goals associated with that game. Collingwood warned us against treating terms as ahistorical entities and going off in search of them. The difficulty with such ideal concepts is, as Ludwig Wittgenstein remarked, they become “like a pair of glasses on our nose through which we see whatever we look at. It never occurs to us to take them off” (this is proposition 103 from Wittgenstein’s Philosophical Investigations ). Looking for science in the past ensures that we will find it. 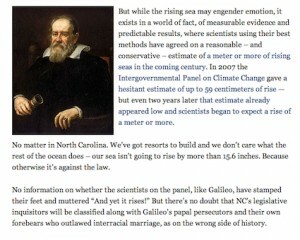 But in finding science, we do violence to that past by distorting it to fit our prejudices. Carson Chow thinks he has solved the obesity puzzle. …it’s something very simple, very obvious, something that few want to hear: The epidemic was caused by the overproduction of food in the United States. From the interview, I don’t see what the mathematician’s expertise contributed beyond some abstract social authority accorded to mathematicians. Chow’s conclusions is, as he says, obvious. Along with being obvious, his conclusion merely echoes the decade-old findings of USDA. The Agricultural Fact Book 2001-2002 covers food production increases and consumption patterns. In the U.S. daily per capita consumption has risen more than 530 calories since the 1970s. Further, the same report details how the foods we consume have changed: record levels of caloric sweeteners, record levels of calories from restaurants, record levels of refined grains (see Is Grandma to Blame for Obesity Today for more details). More disturbingly, Chow ignores the social factors that complicate this picture. Obesity rates are not consistent across socio-economic and ethnic groups. Despite Chow’s claim to the contrary, various research details declining physical activity rates for children and adults. Some of that decline is related to our increasingly sedentary careers. Rates of decline seem correlated to demographic factors. While the proximate cause for rates of obesity is increased calorie consumption, the ultimate causes are more difficult to determine. Chow alludes to some of the complicated social, cultural, and political causes for our increasing calorie consumption but doesn’t pursue them. A real solution to the obesity puzzle will have to identify and address the complex roots of our increasing weight gain. 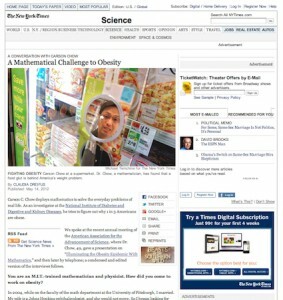 For a different critique of Chow’s conclusion, see The Mathematician’s Obesity Fallacy in Scientific American. 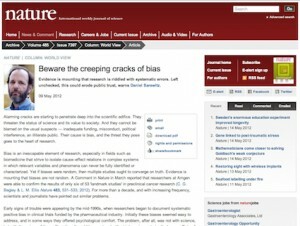 In a recent column at Nature , Daniel Sarewitz worries about the effect that systematic bias is having on science: “Beware the Creeping Cracks of Bias.” According to Sarewitz, scientists can no longer point the finger at traditional causes but now should “recognize bias is an inescapable element of research.” He finds biomedical research most susceptible to bias (his claim is echoed in the comments) but implies that even physical sciences suffer from bias. Sarewitz’s bold column raises some excellent issues. Daniel Sarewitz’s recent column on bias. According to Sarewitz, bias is not a function of scientific research so much as a characterization of the results of that research. Useful, reproducible results are not biased. Useless and irreproducible results are biased and threaten to erode public trust in science and scientists. Such an understanding of bias is naive. Bias shapes the construction of every experiment and the interpretation of every result. Such bias is not necessarily malicious but is inescapable. Bias produces not merely systematic errors or useless results. Bias often guides the very research questions, the construction of procedures thought useful in investigating those questions, and regularly produces useful results.